Delicious full size fruit within 12 months! 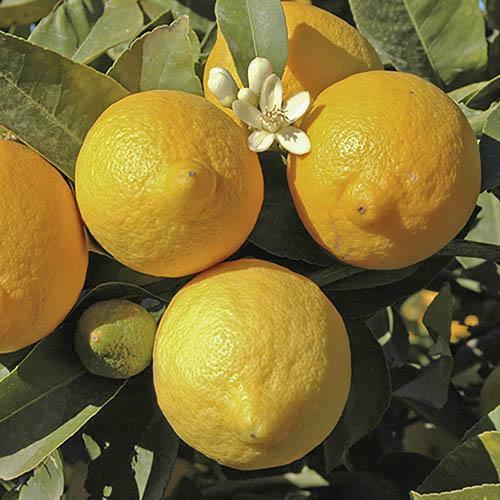 Pick your very own delicious fresh lemons and add a Mediterranean feel to your home or garden! Packed full of vitamin C, these fruits are not only delicious, but good for you as well! Use your fruits in everything from freshly squeezed lemonade, to scrumptious lemon meringue pies, and save loads of money on supermarket prices! This lemon tree will produce blossom from late spring through to the end of the year. From the blossom, small lemons will be produced, which will quickly swell into ripe and juicy fruits which will ripen for picking late summer up to the end of the year. Allow your tree time to establish in its new home and within 12 months you'll grow delicious full-sized fruit! To ensure you'll be picking delicious fruit year after year, we advise you keep your trees in their pots, and place in a sunny, sheltered position. Protect from frost during the winter time either by bringing indoors into a conservatory, or by covering with a plant cosy. Supplied as a 1.2m (4ft) tall, fully mature tree in a 6.5 litre pot. For best results, bring indoors to cool area for winter. Feed with specialist feed every month in spring and summer growth - they are hungry fellows. The sweetly-fragranced flowers appear all year round, especially in late winter, and fruit ripens up to 12 months later - so plants are often in flower and fruiting at the same time. Citrus tend not to thrive in centrally heated homes, so from mid-Jun to late September, give plants a treat and transfer them outside to make the most of the available sunshine - but remember they are not frost tolerant so will need bringing under cover if cold nights threaten. In summer, water freely - ideally with rainwater, while in winter you can reduce the amount - allowing the surface to partially dry out before watering again. Always allow excess water to drain away. Overwatering in winter is one of the commonest problems, so err on the dry side. Only minimal pruning is required to reshape or remove dead or damaged shoots.